The Cave Church of St. Peter (also the Grotto of St. Peter; Turkish Sen Piyer Kilisesi) is an ancient cave church with a stone facade, located just outside Antioch (modern Antakya), Turkey. 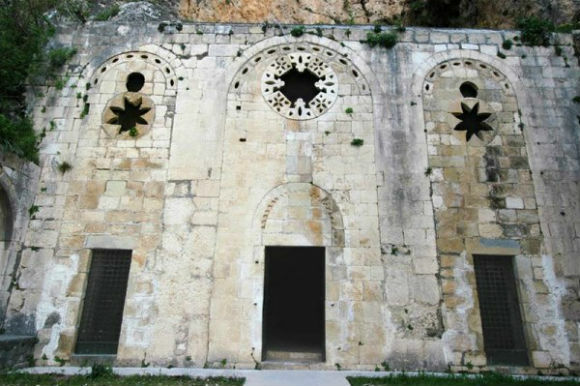 Facade of St. Peter’s Grotto in Antakya, Turkey. The interior of the grotto church is austere and simple. The only permanent furnishings are a small altar, a single statue, and a stone throne. On the walls are the barely discernible remains of frescoes, and on the floor can be seen some traces of mosaics. In the back of the church is a tunnel that leads into the mountain interior, popularly believed to be a means of escape in times of persecution. Worship services are still held in St. Peter’s Grotto, especially on the Feast Day of St. Peter and St. Paul (June 29) and on Christmas. Whether or not you accept/believe that this was one of the first Christian churches, it is an interesting bit of archaeology and architecture. Read a little of the reported history before going to help you understand what you’re seeing. Most interesting to me was standing at the entrance door and looking back at the city seeing the minarets sticking up. It seems like Christianity and Islam have co-existed here for centuries and the locals don’t seem to mind. The main thing is dont go there expecting a revolutionary experience. It is small and quite; however if you are in the area you should visit it. It cost 8 Turkish Lira per person, you can go inside and take pictures. The employees speak English and are there should you need them. The actual location is closed for rennovation but even just looking up to where the first Christian Church in the World is was breathtaking! To think that we walked up as far as they would let us and to know that we were stepping in the same places as described in religous text was very provoking.